Every hour of every day, hundreds of people need essential human services, whether they are looking for employment assistance, food pantries, help for an aging parent, addiction recovery programs, affordable housing options, support groups or ways of becoming part of their community. The call line 2-1-1 can help. 2-1-1 is the national abbreviated dialing code for free access to health and human services information and referral. It is an easy-to-remember and universally recognizable number that makes a critical connection between individuals and families in need and the appropriate community-based organizations and government agencies. The nation’s first 2-1-1 service was created in 1997 in metropolitan Atlanta. Implementation of 2-1-1 was spearheaded by United Ways, and information comes from referral agencies in states and local communities. 2-1-1 is available 24 hours/day, seven days/week throughout Iowa, including Story County, or online. Why would someone call 2-1-1 in Story County? If you're new to the community and need help finding childcare, 2-1-1 could help. If you recently lost your job, unemployment benefits haven’t begun yet and the refrigerator is nearly empty, 2-1-1 could direct you to a local food source. If you suspect your teenager is using alcohol and don’t know which agency to call first, 2-1-1 could help. Local nonprofits have submitted information to the call center about services they provide so 2-1-1 callers receive accurate information. 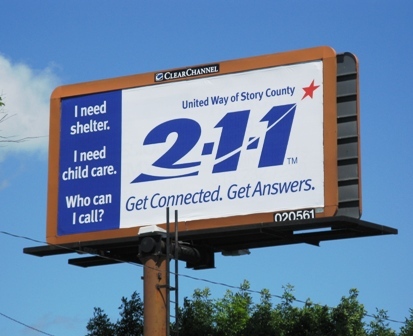 Because of the support of UWSC donors, programs like 2-1-1 are available for everyone in Story County. Click here to download the 2-1-1 brochure.